I made this card for my Grandaughter, the ballet dancer is attached on cord, I used card which, after cutting out the dancer, I embossed with clear embossing and the added Opal Shimmer, the card is 6 x 4. How very pretty is this card and I am sure that your Granddaughter will be delighted with it. The ribbon on either side is the crowning touch and the effect is so easy to create. If you would like the look that Trisha has created please watch the Braided Ribbon Tuorial in that section on the website. That will take you step by step on the process... and even show you how to create a wreath with the same look. 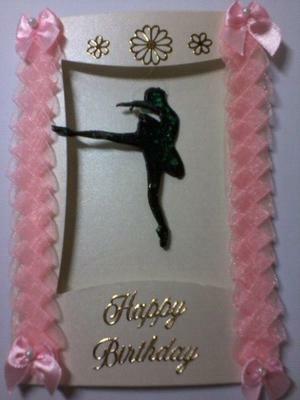 Lovely Ballerina card! I love it! You did a good job! Thanks for sharing!